Last Saturday we (The hubby and kids) were invited to Disneyland to join a few other mom bloggers in checking out the new and improved attraction, “It’s A Small World”! You know the ride… the ride that took you on a journey around the world in those cool little boats… the ride that made you think that this day was the most amazing day you have ever lived (I always felt that way at Disneyland)…the ride that has the “Best” air conditioning in the park(expert tip)…with the song that has long captured all of hearts while visiting the Magic Kingdom and one that stays in your head for weeks! The coolest part? It was not yet open to the public! So a small group of us (30 or so) met by the ride and enjoyed snacks and juice before being escorted to the ride. We took two trips around the magical world and then exited to enjoy a few more snacks and juice. We were then able to ride the attraction two more times before exiting to enjoy the rest of the park with our families. We were in the boats during the taping of the video above. I was able to connect with Deanna from Domestic Chicky, which was such a treat as it was the first mom blogger i have connected with in person! Thanks Deanna, we enjoyed hangin’ with you! Today the famous Fantasy Land attraction will reopen to the public! I have taken a few journeys on it’s a small world as a child, although, it was such a surreal feeling to be reliving all of those wonderful childhood emotions with my own girls. What a wonderful thing for mothers and fathers alike, to relive our childhood on the same rides through the eyes of our children. By the second journey through the ride my 4 year old was allowing everyone to hear the vocal stylings of MILLA! We had quite a few sightings, including Aladdin and Jasmine flying a magical rug in the middle east, Alice in wonderland in Great Britain, Lilo and Stitch riding a surf board in Hawaii and many more throughout the ride. What’s really cool is if you listen closely, you can hear the theme songs from the movies. You’ll also find a new “Spirit of America” scene, represented to suggest that friendship crosses all nationalities including that of the United States. This new world maintains the “it’s a small world” theme and will now capture your hearts just like the rest of the ride..
- Free On Your Birthday – To put everyone in a celebration mood, for the first time ever Disneyland Resort is offering guests free admission to one theme park on their birthdays. Guests can register at www.disneyparks.com. - Guests may book a three-day vacation package for as little as $68 per person, per day with the “Everyone Plays for the Kid’s Price” package. The Details: Travel must be completed by April 30. Each package includes two-night hotel accommodations at a nearby Good Neighbor Hotel, three-day Park Hopper Tickets, Magic Morning entrance (to enjoy select theme park attractions before Disneyland opens to regular guests), an interactive Disney character experience in Mickey’s Toontown, and preferred seating at select attractions and restaurants at Disneyland Resort. 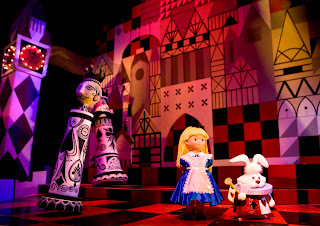 For more information, contact your travel agent, visit www.disneyland.com or call Disney at 1-866-276-6780. - Now through April 30, guests who stay at one of the three on-site Disneyland Resort hotels – Disneyland Hotel, Disney’s Paradise Pier Hotel and Disney’s Grand Californian Hotel & Spa – will receive a Disney Gift Card: $50 for a two-night stay, $100 for a three-night stay, or $150 for a four-night stay. The gift cards are provided upon check-in and available for use at any of the Disney-owned restaurants and stores located inside Disneyland and Disney’s California Adventure theme parks, Disneyland Resort hotels and Downtown Disney. We had so much fun and will look forward to future blogging events at the Disneyland Resort. I encourage you all to visit the Disneyland Resort and relive your childhood through the eyes of your little ones.